Believed in the middle ages to be Aristotle?s letter to Alexander the Great, ?About the Secrets of Secrets? concerns government and is a Latin translation of an Arabic work. A London scribe and King's Clerk, Walter of Milemete, and a team of artists probably made this richly decorated copy in 1326-1327. Milemete intended it to accompany his own treatise on royal virtues for presentation to Edward III. The 'Secrets' was owned by the Earls of Leicester, at Holkham Hall in Norfolk, from the 17th to the 20th centuries. 'Aristotle' is not above a little self-promotion, asserting at the beginning of this section that he gives the very best advice. The section concerns what a king should do when absent from his kingdom, advising him never to leave only one person in his place. 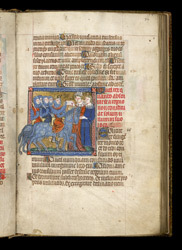 In the picture a king, on horseback and at the head of an entourage of nobles, hands a sealed warrant to a bishop and a nobleman, illustrating the giving of temporary authority upon his departure. The seal appears as a disc dangling from the rectangle of the document.